Austria is voting in a presidential runoff poll that could elect the EU’s first far-right leader, Norbert Hofer. Freedom Party’s Norbert Hofer faces 72-year-old independent Alexander Van der Bellen, backed by the Greens. Norbert Hofer, 45, topped the first vote but fell well short of an outright majority. The runoff is expected to be close. The refugee crisis has become the key issue. In 2015, 90,000 people claimed asylum in Austria, equivalent to about 1% of the Austrian population, and the Freedom Party has run a campaign against immigration. While the presidency is a largely ceremonial post, the president has powers to dismiss the government – something Norbert Hofer has already threatened to do. A Norbert Hofer victory could be the springboard for Freedom Party success in the next parliamentary elections, scheduled for 2018. Polls opened at 07:00 and close at 17:00, with projected results expected shortly afterwards. However, postal ballots, which could be crucial if the result is close, will only be tallied on May 23. 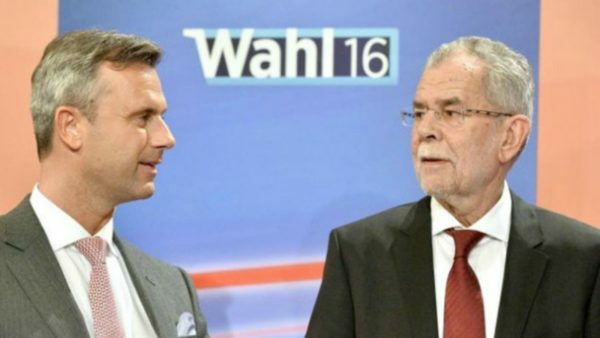 In the first round, Norbert Hofer secured 35% of the votes, while Alexander Van der Bellen polled 21%. At his final election rally on May in Vienna, Norbert Hofer sought to hammer home his message that refugees needed to integrate. The presidents of the European Commission and the European Parliament, Jean-Claude Juncker and Martin Schulz, have both expressed concern that Norbert Hofer could win. Alexander Van der Bellen told his final rally in Vienna that it was likely to be a close race. “I think it could be on a knife edge – 50-50 who will win, so this time, as with previous votes, but more than ever for this important election, every vote will count,” he said. Norbert Hofer and Alexander Van der Bellen had engaged in a TV debate earlier in the week, described as “political mud-wrestling” by commentators. The Social Democrats and the People’s Party have governed Austria for decades, either alone or in coalition. At the last general election in 2013, they together won just enough votes to govern in a “grand coalition”. Incumbent President Heinz Fischer, 77, could not run again after two terms in office.